The constellation Orion is an easily recognisable star grouping visible in the northern hemisphere in even the most light polluted skies. Orion is depicted in amy ways: as a hunter wielding a club and shield, brandishing a sword and shield, or clubbing a lion. These however are just visualisations interpreting a pattern in the stars. The best way to identify Orion is by finding the two bright stars Betelgeuse and Rigel. If you draw a line between these stars there should be a line of 3 stars in the middle. Even on a night with poor visibility you should be able to see these stars. Betelgeuse is Orion’s shoulder, and Rigel is his leg or ankle. The three stars in the middle Alnitak, Alnilam, and Mintaka (left to right) form Orion’s belt. 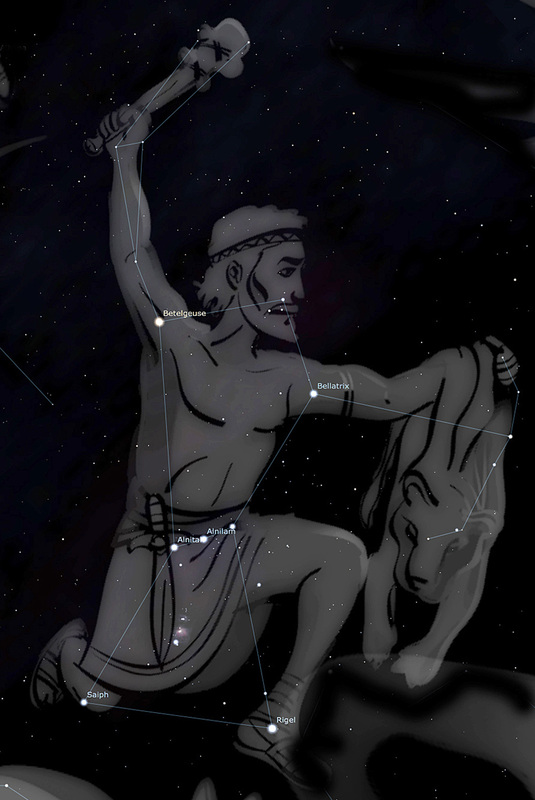 To the right of Betelgeuse above and to the right of the belt is Bellatrix forming Orion’s other shoulder. Drawing a line through the middle star in Orion’s belt is Saiph representing Orion’s knee. On a darker night with good visibility you will be able to see some of the fainter parts of the constellation. The most interesting is the Great Nebula in Orion. 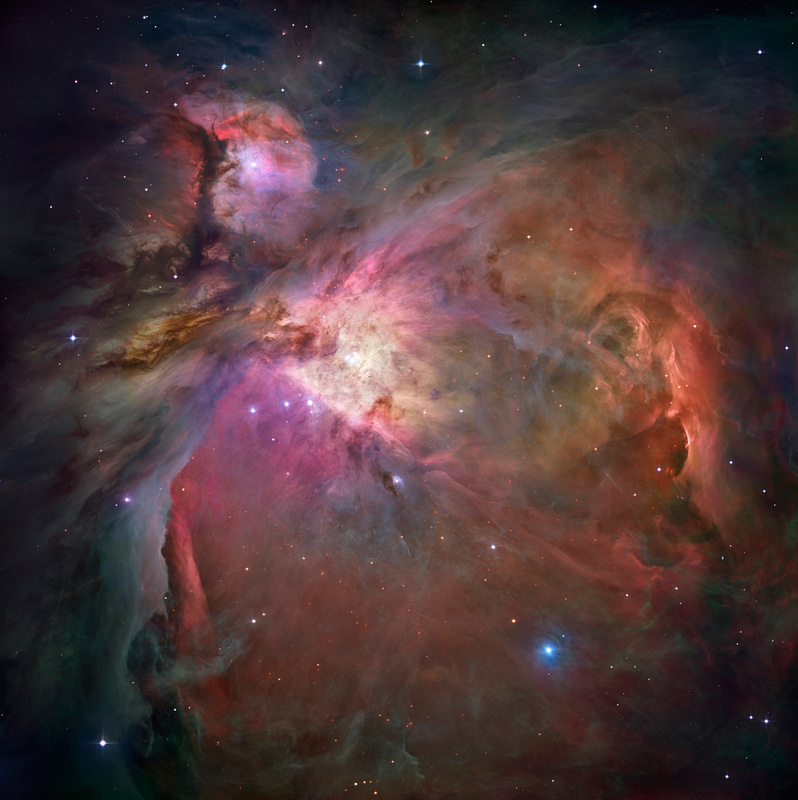 The Orion Nebula can be seen just under Orion’s belt and will look like a smudge or cloud to the naked eye. This nebula is a good example of a star forming region in the galaxy. What you are actually seeing is a cloud of stelar dust about 24 light years across and 1,340 light years away. Looking at the nebula with different instruments reveals ever increasing amounts of detail. Starting with the naked eye you can see a gray smudge, moving up to binoculars the cloud starts to form in your vision. With a low powered telescope you can see the nebula and a few stars, but the stars are all merged together into a single light source. As you use ever increasing magnification eyepieces or more powerful telescopes other details start to emerge and you can start to see some of the individual stars in the nebula. With the highest magnification you will see the trapezium. This at first appears as four stars arranged in a rectangle. However, those of you with sharp eyes will be able to separate out all six stars in the cluster. Up to now what we have seen has all been in monochrome. The vivid colors of the pictures that you see of the nebula are only obtained using long exposure photography. The long exposure capability of the camera allows more photons of light to be recorded thus capturing the colors of the nebula. The human eye is a very clever device. In order to compensate for low light levels it switches to monochrome to allow more detail to be seen. This allows us to see some of the faint details of the celestial wonders, but not to appreciate their full glory.